Istanbul's Ataturk International Airport Attacked; More Than 30 Killed : The Two-Way Several videos have emerged that show security-camera footage of the attack. In one, dozens of people flee just before a fiery blast hits the check-in area. 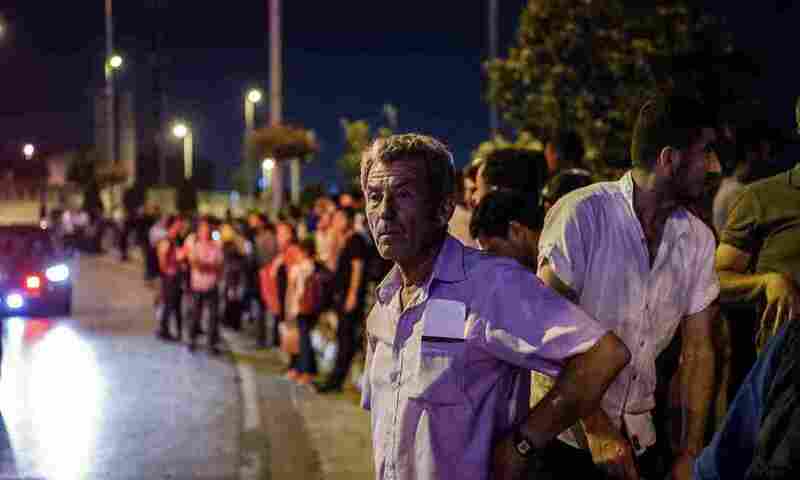 People wait outside the Ataturk airport in Istanbul, where dozens have died in an attack on Tuesday. 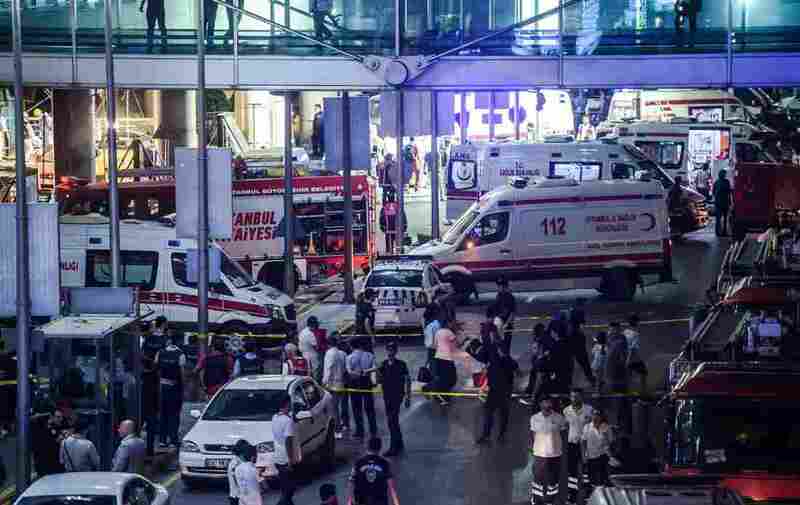 At least 36 people died in an attack on Istanbul's Ataturk International Airport Tuesday night, according to Turkish Prime Minister Binali Yildirim. More than 140 people were injured in the attack, in which at least one explosion followed an outburst of gunfire. Providing an update hours after the attack, the prime minister said officials suspect the attack was committed by extremists loyal to ISIS. He also confirmed details about the attack, saying it was carried out by three suicide bombers who opened fire before detonating their explosives. Yildirim also said that it appears the attackers had arrived by taxi. Justice Minister Bekir Bozdag says at least one explosion hit near a main entrance to the airport. "The minister said a terrorist opened fire with an AK-47 assault rifle at the international terminal before detonating a suicide bomb," reports the state-run Anadolu Agency. In an unusual occurrence, footage of the attack is being shared on Twitter, in several videos that rely on smartphone video taken of the airport's security camera monitors. One such video, seemingly taken from the camera above the check-in desk, shows people running from the area of the explosion. While the video doesn't include graphic images of personal injury, we'll warn you that it does depict a traumatic event at around the 17-second mark, as the blast generates a powerful fireball. Another video posted to Twitter suggests security personnel shot an armed attacker as he ran around a corner in the airport. That video shows people fleeing from a man who then falls to the ground. The man struggles on the ground for some 20 seconds before the scene is overtaken by a large explosion. In one harrowing video, the moment the blast struck seems to have been captured. The images show a large fiery blast — one that could have spread devastation much farther if it hadn't been at least partially contained by a hallway. At the end of the sequence, people who seem to have been only around 50 feet from the blast are seen running away. The video was posted to Twitter by many accounts; several of those postings have since been removed. 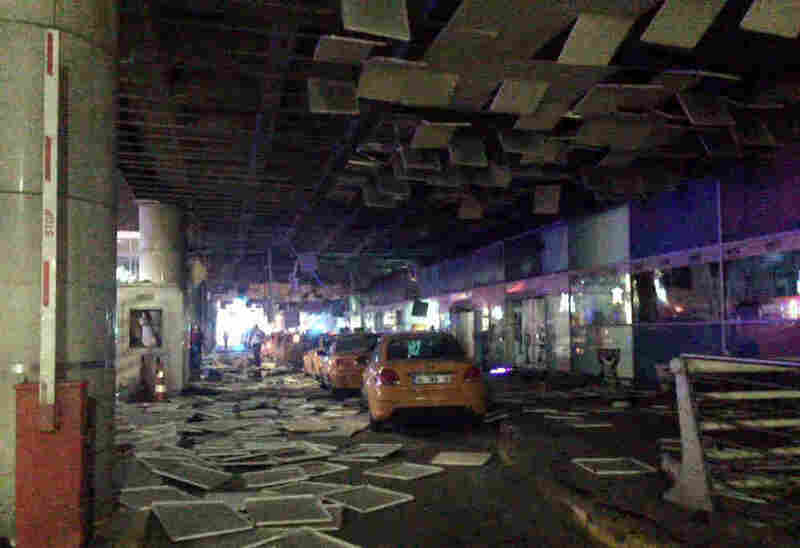 With a report from Ataturk International Airport, Time magazine's Middle East correspondent Jared Malsin tells NPR's Robert Siegel that several witnesses who were inside the airport say they heard "at least two explosions" — and possibly three. On today's All Things Considered, Malsin also says an American passenger whose plane was landing at the time of the attack shared photos showing "what looked like broken glass at the passport control" area, beyond the security gates that are closer to the entrance. Some reports depict at least one attacker being killed by police, Malsin says – but he adds that facts are still coming out, and that a definitive narrative is yet to emerge. Shortly after the attack, TV news channels in Turkey put out an online video stream that showed more than a dozen ambulances responding to the airport. In one sequence, a police officer was seen walking out of the building, his shirt stained with blood. A live online broadcast from the Dogan News Agency also showed ambulances, private vehicles, and a taxi cab rushing up to the doors of a hospital, unloading bloodied patients who were quickly taken inside. One eyewitness video that was posted to Twitter showed a scene of panic inside the airport, as a man who apparently works at the facility urged travelers to flee down a hallway. Consulate staff at the U.S. embassy in Turkey are now working to determine whether any Americans are among the victims of the attack. Just one day ago, the U.S. State Department issued a travel warning to U.S. citizens, citing "increased threats from terrorist groups throughout Turkey." The embassy has posted a page to help travelers. Calling the Ataturk Airport "a symbol of international connections and the ties that bind us together," White House Press Secretary Josh Earnest issued a statement condemning the attack. "Our deepest condolences go out to the families and loved ones of those killed, and we wish a speedy recovery to those injured," Earnest said. The violence comes after a string of attacks have hit Turkey — including two deadly strikes in March that targeted Ankara and Istanbul, as well as another attack near military buildings in Istanbul in February. This is a breaking news story. As often happens in situations like these, some information reported early may turn out to be inaccurate. We'll move quickly to correct the record and we'll only point to the best information we have at the time. Click here for the latest.